The eleventh ranked Orange were fired up and ready to go as they entered their tilt with in-state rivals, Cornell. After dropping two games to the Big Red last season (one regular season game, one NCAA tournament game), ‘Cuse had a lot to fight for. 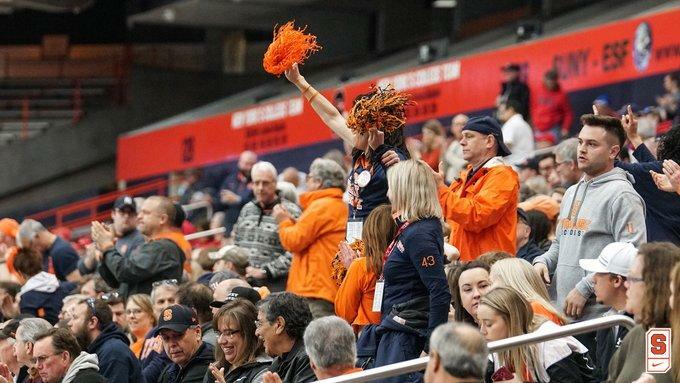 However, devoted fans of the Orange may have had their minds on a much more historic Syracuse-Cornell matchup. Nearly 10 years ago, Syracuse and Cornell competed for the National Championship. That game would see the Orange complete arguably the greatest comeback in NCAA Men’s Lacrosse history and capture their eleventh title since 1971. The stage was set for this game to be an all-time classic, but Syracuse didn’t want a fairytale ending. For an Orange team that is often criticized for having slow starts, they came out blazing hot. They dominated possession, tiring out the Cornell defense and drawing a couple of penalties within the first five minutes. From there, attackman Stephen Rehfuss took control. He scored his first goal just after the eleven-minute mark in the first quarter – giving the Orange a lead they would never relinquish. After a Cornell crosscheck, Syracuse’s man-up line doubled their lead off a laser shot from leading goal scorer Bradley Voigt. The rest of the first quarter continued in this fashion with Rehfuss extending the lead to 3-0 before Cornell’s Connor Fletcher struck back to make it 3-1. As the first quarter ended and the second began, the Bears established a stronger offensive presence. While they were often trapped in their own zone, they found opportunities to break out in transition and lead attacks with numbers that often led to scoring chances. After the lead had been stretched to 4-1 ‘Cuse, Cornell’s Brandon Salvatore scooped up a tough ground ball at midfield and fired a pass upfield that would eventually land in attackman John Piatelli’s lap, who completed the easy finish. Piatelli would pad his stats with a second goal later in the quarter. But when the dust settled, and the teams headed to half, Syracuse still had a commanding 7-3 lead. All in all, the first half was an onslaught. The Orange won eight faceoffs to the Bears four, had 14 shots on goal to Cornell’s six, and picked up 23 ground balls to Cornell’s 13. 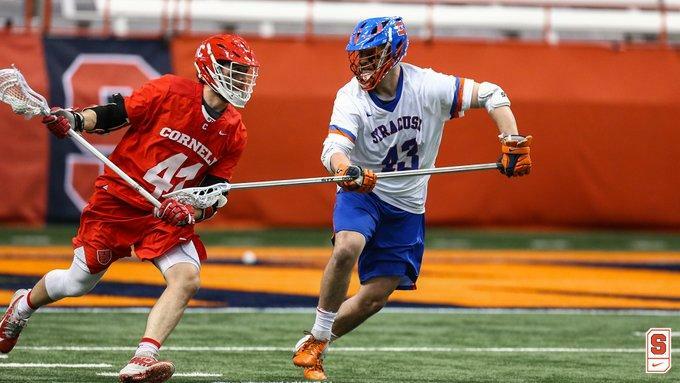 The Cornell offense would show up for three or four minutes at a time, but then quickly returned to defending for their lives as they put way too much pressure on freshmen goalie Chase Ierlan. There was no facet of the game that was not being dominated by the men in blue and orange, and it continued into the second half. 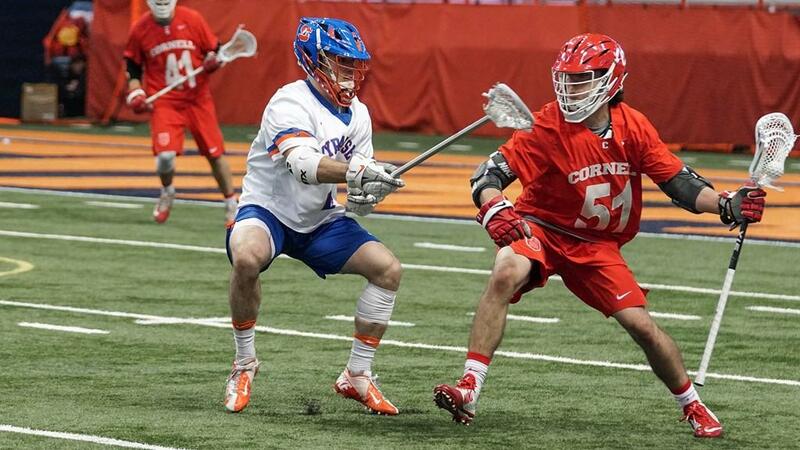 Cornell, looking to flip the script on a Syracuse team known for comebacks, started off the third quarter with energy and intensity. Bears midfielder Connor Fletcher tallied his second goal of the game less than two minutes into the half to cut the Orange lead down to three. The next few minutes saw Syracuse and Cornell trade goals from Jamie Tromboli and Cooper Telesco respectively. From that point on, though, the game was decided. The Orange scored four consecutive goals - including Stephen Rehfuss’ hat-trick goal and two from Bradley Voigt. They took a 12-5 lead and coasted towards the final horn. Cornell scored a couple of consolation goals late in the quarter, and John Piatelli added his 36th goal of the season; scoring his third in the fourth quarter. The score would finish at 13-8, moving the Orange to 7-3 on the season. With Cornell in the rearview mirror, Syracuse will travel to Chapel Hill on April 13 to take on the Tar Heels. - After averaging more than 16 goals per game, the Big Red was held to just eight goals in this contest – two of which came in the final eight minutes. - Freshmen goaltender Chayse Ierlan recorded a career-high 17 saves. - Syracuse got off to a blazing start, taking a 3-0 lead, after having fallen behind in nearly every previous game. - Bradley Voigt recorded his sixth hat-trick of the season. - The Orange have won four of their last five games, including three wins against ranked opponents.